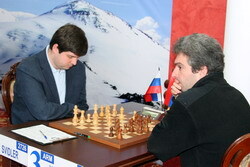 The main story of the 11th round is heroic survival of Levon Aronian in the game against Rustam Kasimdzhanov. A lot of work and a bit of luck brought the desired result that allowed Levon to maintain his first place. 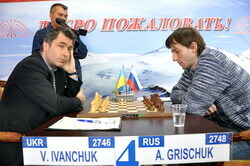 Habitual time troubles of Grischuk had to work against the player; Ivanchuk’s creative play required some reward. This is exactly what happened in today’s encounter. Grischuk handled well the first part of the game. I think the exchange sacrifice 17.Qxf4 does not give White a real advantage. Black could quickly create good counterplay by, for instance, 21…Nf6! The decisive events occurred in the time trouble. Grischuk’s sharp 29…Nxc6 could be justified if Alexander found 31…Qd7! – in this case it would be everyone’s game. Taking on g4 was a clear mistake. Ivanchuk cynically captured everything he was offered, easily parried all the one-move threats and launched the decisive counterattack. The opening was a very original Hedgehog with the bishop on d3. White’s standard kingside attack was adequately met by a good novelty 14…Rae8!? Simplifying exchanges started after 15…exf5. 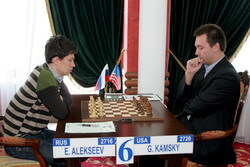 Later Kamsky had many chances to secure the equality, however, it seems he really wanted to play for a win! And... he overpressed. Evgeny defended accurately, and after the reckless 35…Nf5? simply took the pawn. To be honest, I have no clue about the rest of the game. Why Alekseev refused to play for a win and forced the move repetition? He could play 41.h4, put the pawn to h5, remove the knight from g3 and start looking for a breakthrough. Apparently, they both are extremely tired. It seems Karjakin experiences chronic problems in his favorite Najdorf Sicilian. A hopeless loss from Akopian was followed by an even more hopeless and depressing one. Maybe Karjakin had practical chances to survive in the endgame after 36…e5! (instead of the losing 36…a3? ), but this does not excurse the preceding torture. Black made a new move 16…Bf5, but failed to equalize. He had the inferior structure and absolutely no counterplay. White’s advantage grew steadily while Bacrot was making all the natural moves and increased pressure on the c6-pawn. Maybe he could win without giving the opponent any chances, but let us not ask for too much. He won the game – well done! This game does not inspire the commentator. A very quiet line of the Ruy Lopez led to a symmetrical pawn structure. Black completely equalized by the timely 14…a5!, after which White no longer had any targets. Soon the game was drawn officially. In every tournament someone loses a drawn rook ending. Even simple positions are often difficult to defend, when the player is tired and experiences time trouble. Mamedyarov defended well for quite a while, but then began to lose ground. His defense method 48…Rb3+ was too creative. A draw could be reached by the simple 48…Kxe5 49.Rxg7 Rb3+ 50.Kd2 (50.Ke2 Rc3!) 50…Kd5 51.Rxh7 Kxc5 52.Rf7 Kd4! 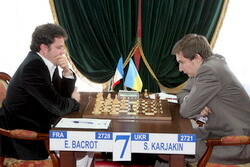 Shakhriyar’s move allowed the opponent to keep the passed pawns. However, then it was Boris’ turn to err! Instead of 53.c6 he could win by 53.Rxg7 Rxh2 54.c6. And yet, the last man to make a mistake was Mamedyarov. Black could survive by 53…Rc2+! 54.Kb5 g5! – the passed f-pawn distracts the White’s rook. After he missed this chance, Gelfand finished the game by 56.Kb3! It turned out that taking the c7-pawn gets Black to a lost pawn ending. In a fashionable line of the Meran (9...Bd6) the grandmasters opened the center, and White got better chances due to the fact that Black’s minor pieces were restricted by the e4-pawn. I didn’t like Eljanov’s 19.Qc2 – I think 19.Nf5! Qc5 20.Qe3 would give him dangerous initiative in the endgame. Perhaps Pavel wanted to get the same kind of position with the queens on the board, but Peter cleverly used the tempi he was granted. After the knight was transferred to c5, Black played 23…f6! and solved opening problems. 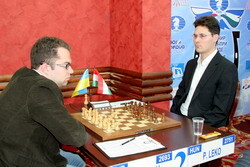 Eljanov continued to play for a win and at some point overstepped the limit of risk. After 33.Nd5? Leko could win a pawn by 33…Bxg4!, but somehow missed this simple tactics. Self-pinning by 36.Qc5 (it was better to bring the knight to d4) was also a brave decision. In order to survive, the Ukrainian grandmaster had to find a number of strong moves – 37.e5!, 39.Kh1! – which he did and eventually achieved the desired draw. The leader survived the epic battle! Kasimdzhanov played an impressive game and was very close to a victory, but finding the solution even in the analysis was not an easy task. In a well-known and deeply analyzed line of the Anti-Meran Rustam employed a very tricky queen maneuver 14.Qd3! exd4 17.Qxd4 Be7 18.Qf4!, transposing to the endgame that looked harmless for Black – but was actually very poisonous. Black could complete the development only by making serious positional concessions. Needling moves of Kasimdzhanov 27.a4! and 29.a5! created dangerous threats. The a5-pawn was extremely powerful. 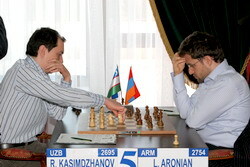 At this point Aronian’s situation looked critical. The survival operation began with 29…b4! and continued by 31…h5! However, I am not sure whether Black could survive if White found 36.Ra7! He could sacrifice the f4-pawn in many lines, and it would be difficult for Black to simplify the game. After the exchange of the minor pieces Levon saved his skin without much trouble.